Nestled in rural Raurimu, this picture perfect, 4 bedroom purpose- built holiday home has everything you need for the perfect getaway. Probably the newest build in the area (built in 2011) with all modern features including double glazed windows to keep you cosy on the coldest of winter nights or cool during the hot summers. The kids will enjoy playing on any of the three paddocks (fully fenced) or roasting sausages and marshmallows on the purpose-built outdoor fire pit. Located minutes from National Park Village and within 25 minutes to the ski fields, you don't have to travel far to experience this beautiful area. The chalet is well equipped, with lovely comfortable beds and quality warm bedding. Ideal for a family retreat or a place to share with friends. Pack the bikes and the skis and discover the Central Plateau. Come and create your next holiday memories here. 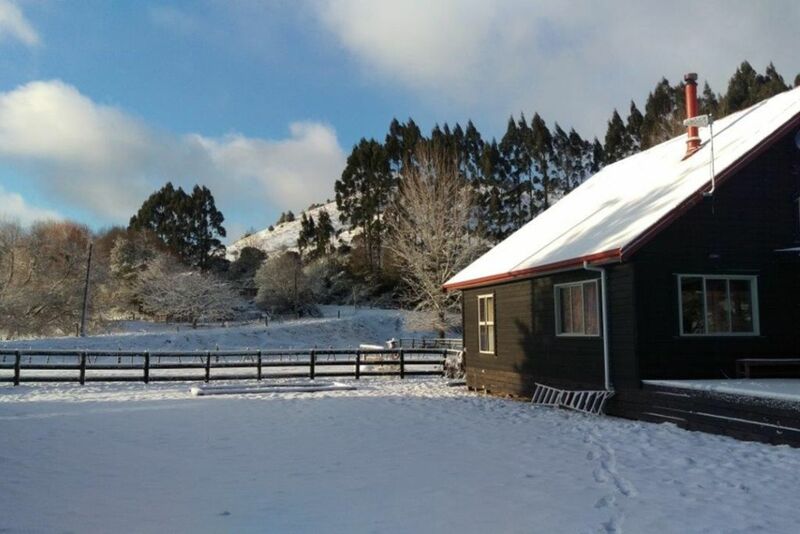 Raurimu is famous for the Railway Spiral, local horse riding, local quad bike adventures and a micro climate because its nestled below the hills. Fantastic hunting and fishing to be had in the area along with the more common outdoor adventures the region has to offer. Large home for families and friends. Lots to explore in the area! We stayed at several homes while in NZ and this was our favorite. The home has large yards on all sides for kids to run around and a huge deck to relax on. We stayed here while my son and I hiked the Tongoriro Alpine Crossing. My husband stayed back with the younger kids and enjoyed the property. We were here in the summer but it seemed like the perfect winter home too. Large fireplace with tons of wood supplied. You won't regret staying here. Also, home is a close drive to bakery/cafe and has an atv adventure company just around the corner. Was such a beautiful place, fell in love instantly. Was such a beautiful place, fell in love instantly. Felt so homely and the fire place was perfect. Only downsides were hotspot issues and upstairs shower wasn’t cleaned from the previous clients so the water didn’t drain properly. Very minimal problems, otherwise we could not complain. Would definitely book and stay here again! We love this place. Perfect for the kids, and a true get away from Auckland. Has everything needed and it warm, clean and comfortable. Poor internet and a rooster over the road. It's a shame the 2 comments for feedback you leave are negative. You need to remember the 2 issues you had are out of our control. Our internet is via a mobile phone connected to an external antenna (which you were made aware of months ago when you booked) & roosters or other animals are often in rural areas. Most visiters find this a positive & due to our property being double glazed you normally can't hear much outside. Peaceful spot that really suited our needs. Peaceful spot that really suited our needs. The kids loved the trampoline and firepit, and the adults appreciated the space and comfort. A few more wine glasses would be good. Thanks for your feedback and we're glad you had a great time. My wife agrees with you about the wine glasses so that something will be sorting when we're there next :-) thanks!